Cabbie’s Curios: Mind Your Head! Over the centuries, there have been several versions of ‘London Bridge’ and, from the original, wooden structure built by London’s ingenious Roman founders, to the present day span which opened in the early 1970s, the crossings have all- give or take a few yards- stood on the same site. 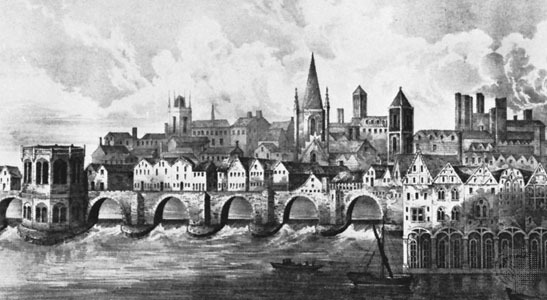 Perhaps the most famous London Bridge was the one built by church chaplin, Peter de Colechurch, which served the city for over 600 years; from approximately 1176 to 1831. Although it was demolished during the reign of William IV, the old London Bridge is a familiar icon today; famed for being the Thames crossing which boasted 19 arches and a huge array of shops and houses. For decades (until a second crossing opened at Westminster in the 18th century), London Bridge was the city’s only Thames crossing. As such, it was also a major route into the capital for travellers approaching from the south; a fact which remains to this day (follow the A3 road directly south from London Bridge, and you will eventually end up in the important maritime city of Portsmouth). 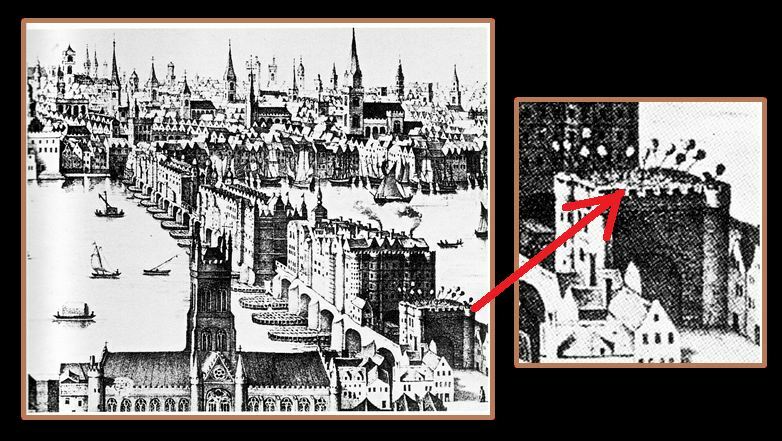 In days gone by, the historical City of London was technically a gated community; surrounded by a lofty wall and controlled entry and exit points. Keeping in line with this, the Southwark end of the bridge was fortified with a gatehouse and drawbridge. For many years, the top of the gatehouse was home to a collection of vicious spikes; long, sharp poles upon which were stuck the heads of executed criminals. Whenever a fresh head was brought along for display, one of the bridge’s gatekeepers would first parboil the unfortunate noggin, before proceeding to dip it in tar; a tried and tested recipe which ensured the decapitated head would persevere for a while; offering it some protection from London’s biting weather, and the unwanted pecking of pesky birds. After a few weeks or months, when said head lost its charm and began to give off a stench that was noticeably stronger than the surrounding piles of mouldering rubbish and animal dung, the gatekeeper would simply climb up, pluck it off the spike and toss the rotting remains into the Thames. The very first head to be exhibited in this grim way belonged to a very famous historical figure indeed; Scotsman, William Wallace. Following his gruesome execution at West Smithfield (where a memorial can be found today) in 1305, the Scottish nobleman’s decapitated head, which had once played host to patriotic notions, was hoisted above the bridge, kick-starting the morbid custom. Other famous bonces to displayed above the old London Bridge belonged to Jack Cade (ringleader of a huge, 15th century rebellion) and Sir Thomas More; the unfortunate political figure who happened to fall foul of the tyrannical King Henry VIII, and was put to death in 1535 (it is said that More’s daughter, Margaret Roper, managed to retrieve her father’s head from London Bridge, and had it buried at St Dunstan’s church in Canterbury). Countless heads were plonked above the entrance to London Bridge over the years. In 1598 for example, one German visitor noted that there were over 30 on display; a truly gruesome gaggle. Similarly, in 1616, Dutch engraver, Claes Jansz Visscher, created his stunning panorama of London; a beautiful and historically priceless etching which provides us with a view of London, prior to the Great Fire of 1666. The custom of exhibiting chopped off heads on London Bridge continued for 355 years; the last victims being aired in 1660. Oh, I doubt that I will be able to view The Shard in the same way now. I’ll always think about this post. As always Charlie, you are a treasure trove of information. I love it. We cross London Bridge several times a week, so I know it well. We also frequently visit the station of the same name, the launch pad for our southbound expeditions. 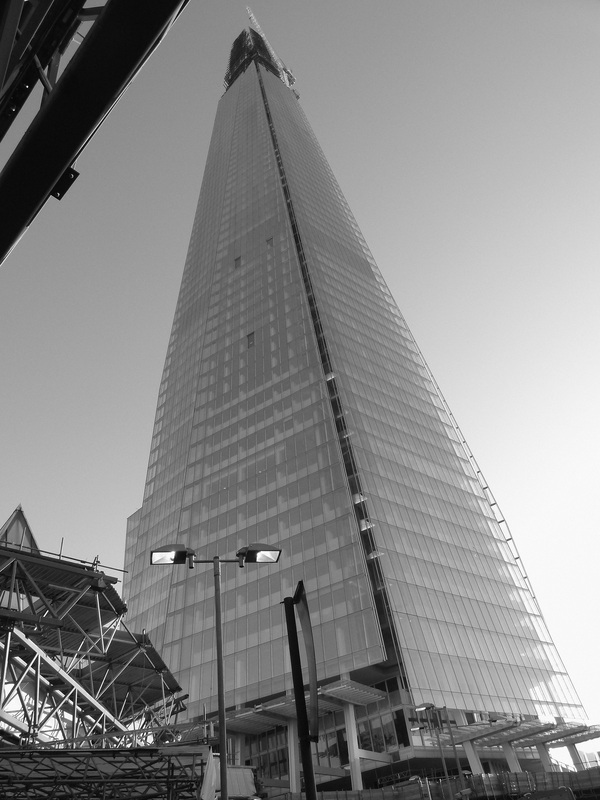 At the risk of introducing a sour note, I consider the Shard an abomination. It is far too big and ugly for London and defaces its skyline. 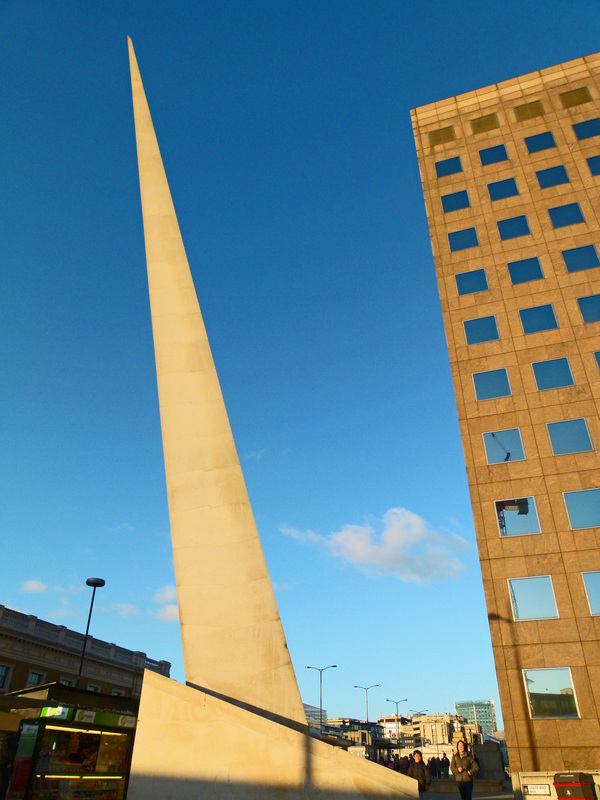 It is a symbol of the triumph of the same greed that is creating other oversized buildings in our city. Thank you so much for your kind comments. I think ‘The Shard’ is going to be one of those ‘Marmite’ buildings; you’ll either love it or hate it!